This is a tapered stitch design utilizing a simple six fold radial symmetry. 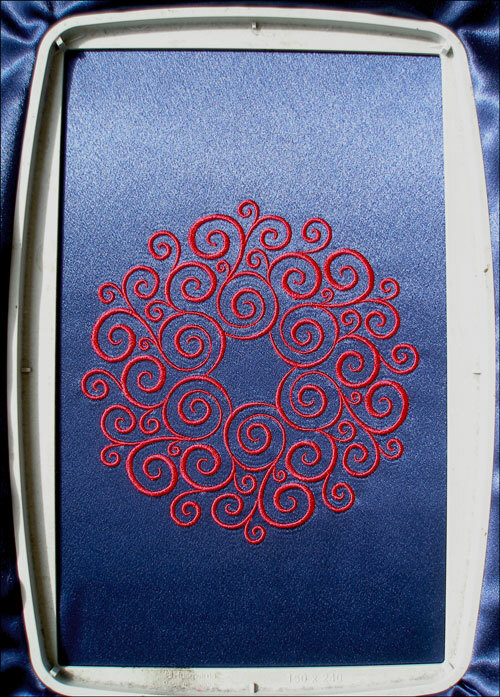 This design ( pictured left ) was stitched out on blue satin using a Husqvarna designer 2 embroidery machine with a standard 15 by 20 centimeter frame by john Coldwell using SophieSew version one embroidery software. Please select your embroidery file type and design size from the two combo boxes provided (left) and then click the download button (right most) to obtain your design. Copyright © 2013 - 2014 Carlos Mandell. All Rights Reserved. Design & development by Carlos Mandell And John Coldwell.